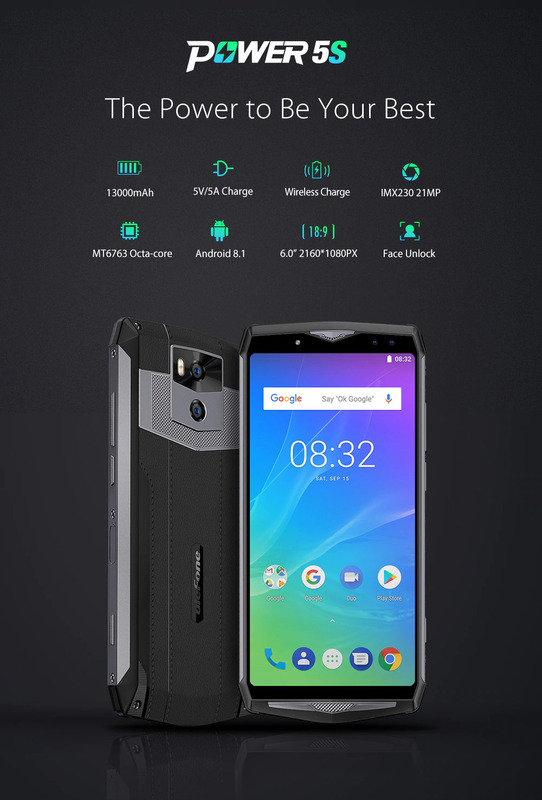 Ulefone is one such brand that has a great reputation for their rugged devices & also bearing huge capacity batteries in their devices. Apparently, the Chinese brand has announced a new device to join their portfolio, yes, none other than Ulefone Power 5S. 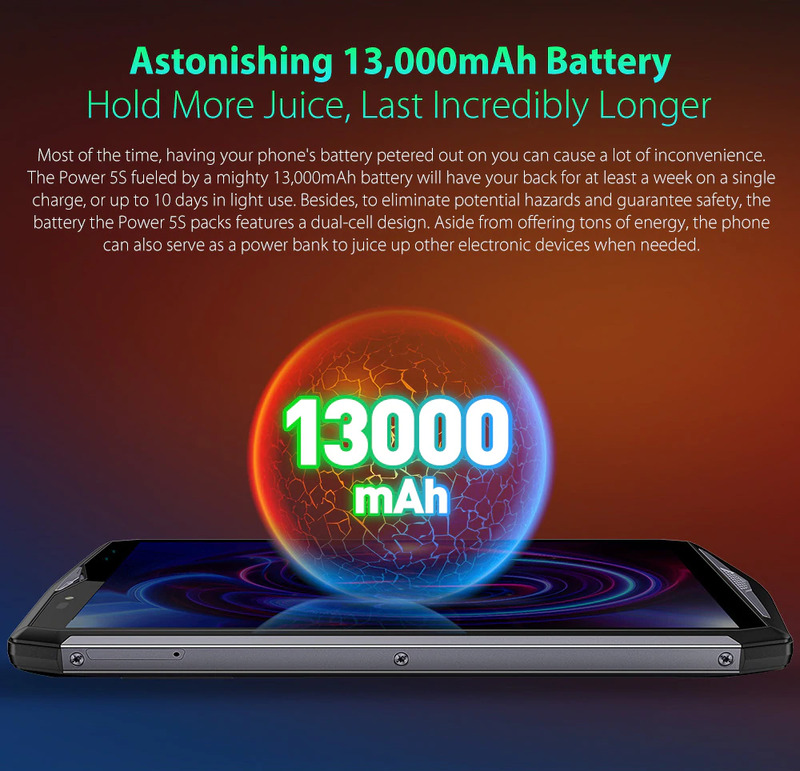 The Ulefone Power 5S comprises of a massive 13000 mAh battery bundled with a RAM of 4 GB. This year earlier saw the launch of Power 5 by Ulefone itself which came packed with the same battery size. But it had a larger capacity RAM of 6 GB. Ulefone Power 5S comes in a single color variant which is only in black color & it is priced at USD 199. The Display in Ulefone Power 5S features a crisp 6-inch FHD+ in cell 18:9 aspect ratio. The display protection is taken care of by the Corning Gorilla Glass 4. As the name suggests regarding the power department, the Ulefone Power 5S is powered by MediaTek MT6763 Octa-core processor clocking at 2 GHz. The phone boasts a 4 GB RAM which is accompanied by 64 GB of internal storage which can further be expanded up to 256 GB of course via microSD card. The camera hardware consists of the standard dual camera setup with an oozing 21 MP Sony IMX230 sensor & a 5 MP depth sensor at the rear. While at the front as well there is a dual camera setup of 13 MP shooter with a 5 MP depth sensor. Due to the form factor & the ginormous capacity of the battery the company will provide with 10W wireless charging in the package also with a 25W 5V 5A Power charger to charge the battery really quick. Well, at this price point wireless charging is more than welcome. It will also challenge other competitors in the market to come out with this technology in this price segment. You would expect at least an Android Oreo OS which is more or less a standard for the midrange segment these days; the Ulefone Power 5S comes out of the box with Android 8.1 Oreo. Finally, coming down to the connectivity department, there’s a side-mounted Fingerprint sensor, 4G LTE, Wi-Fi 802.11 a/b/g/n 2.4G/5G, power efficient Bluetooth 4.1, GPS, USB 2.0 & Type-C.
You can opt to buy the Elephone Power 5S in the special pre-order sale for about US $199. You can buy this phone exclusively from AliExpress.